Most of us know that Lucky Charms may not be the low sugar cereal choice, buy let’s be honest the little crunchy marshmallow treats inside the cereal is a top choice for a sweet treat. If you are one of the Lucky Charm fans that can’t help but pick out a handful of the little uniquely shaped sweet pieces from a box, we have great news for you. Lucky Charms announced today the return of the Lucky Charms Marshmallow Only Promotion, awarding 15,000 limited-edition boxes of marshmallow only cereal to fans across the country. The brand first unveiled the promotion in 2015 by granting ten winners their very own box of Lucky Charms Marshmallow Only, and then again in 2017 expanding to a 10,000-box giveaway. 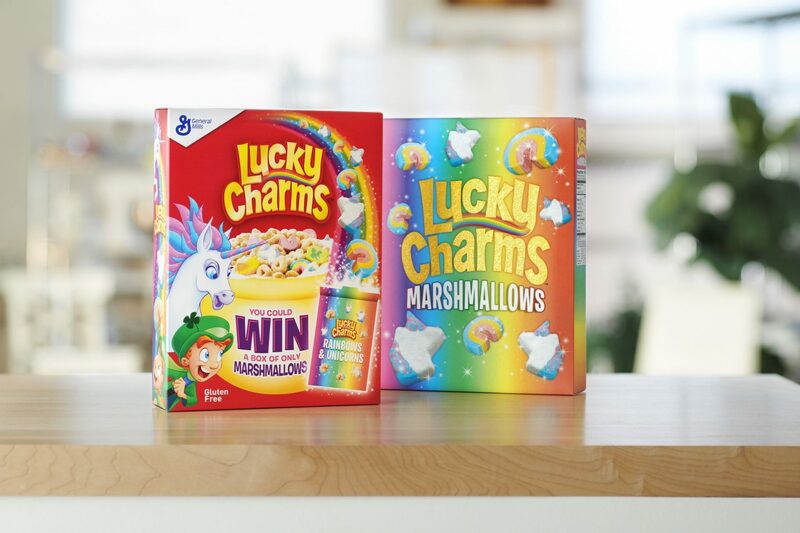 After overwhelming success and enthusiasm following the first two campaigns, Lucky Charms is bringing back the promotion for the third time – now with an exciting twist: boxes will be filled with rainbow and unicorn marshmallows. Lucky Charms announced the return of its Lucky Charms Marshmallow Only Promotion. 15,000 winners will receive a limited-edition box filled with rainbow and unicorn marshmallows. For a chance to win 1 of 15,000 enchanted boxes, look for specially-marked Lucky Charms promotion boxes at retail stores nationwide appearing now through summer 2019. Enter the code found on the inside panel – at MarshmallowOnly.com – to reveal if you’ve won! Winners will receive a special box of Lucky Charms Marshmallow Only shipped to their door. Winners of the limited-edition Lucky Charms Marshmallow Only boxes will also receive membership into the elite Lucky Charms Marshmallow Only Club. As the only cereal with marshmallow charms, Lucky Charms has been a beloved cereal for families for more than 50 years. The Lucky Charms Marshmallow Only Promotion will bring a little extra magic to Lucky Charms fans everywhere. For more information on how to win a box of Lucky Charms Marshmallow Only, including an alternative method of entry, please visit MarshmallowOnly.com or join the conversation on Lucky Charms Facebook, Twitter and Instagrampages and follow the hashtags #MarshmallowOnlyClub and #LuckyCharms. Must be 18 years or older to enter.